I stopped into the Stubbs & Wootton boutique. of this classic Stubbs & Wootton wedge. is really known best for this preppy staple. And, that’s when I spied these! old school staple was looking to shake things up a bit! with a renewed sense of curiosity, and then saw THIS. 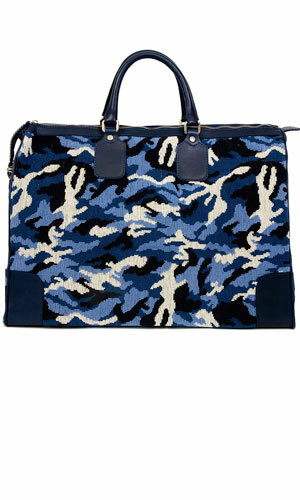 I love this blue needlepoint weekender! It’s like Mary Poppins meets Private Benjamin. Love Stubbs–they have a great shop in Southampton. Tried to get my husband to buy the "screw" loafers, but he went for a tamer motif! those wedges are a dream so classic… and so 50s style as well! Ha! Too funny!! Somebody has quite a sense of humor…the bag? Love it!! Traditional with a twist, my favorite! You need that little love-seat…perhaps in shades of grape and aubergine. I can think of a couple of times I would have loved to have been wearing those whimsical slippers…outside of the house! I really am digging the embroidered flats! So stylish and makes a statement! I am also having a giveaway for my 100 followers! Please stop by to enter! Laughter really is the best medicine. I love witty tongue-in-cheek sorts of designs, like that. That gave me a good giggle this morning ! 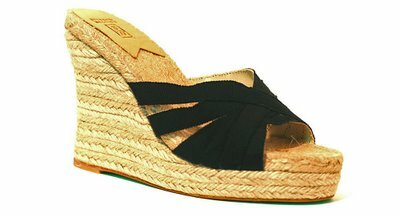 I will have to go browse some of the new stuff….although I still love the classic wedges. Love those wedges! Wedges with jeans, dresses, shorts…it all looks good. You will get your moneys worth with those wedges! Classic and Chic! 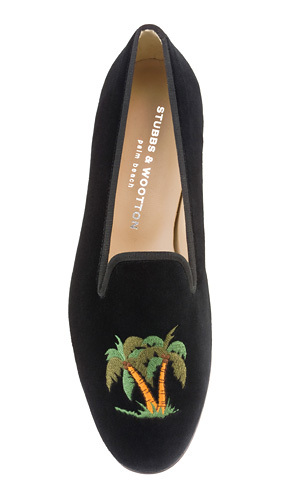 Lately I have become fixated on needlepoint shoes and also stumbled on the Stubbs & Wooten, I didn't know they also did bags…LOVE IT! never heard of these, thanks for the intro. I had a pair with anchors, and I love the wedges! That loveseat and purse…..OMG! Ha, I wondered who made those little slippers, I used to see women in Atlanta wearing them all the time! I love to see a new, edgy take on a classic, very clever! Great post, and if you get a second, stop by and check out my Catherine Deneuve giveaway! Those shoes are so funny! I think the 3rd pair is quite interesting. We still don't get a lot of asymmetric shoes. Those wedges are pretty much amazing. Love the wedges AND the bag! Too fun! I"m laughing at my self because first I thought it was a nail. Wake up Marija! I have to convess never having heard of this brand but I do own that wedge from a different line. PERFECT for summer. I'll have to check out S&W! 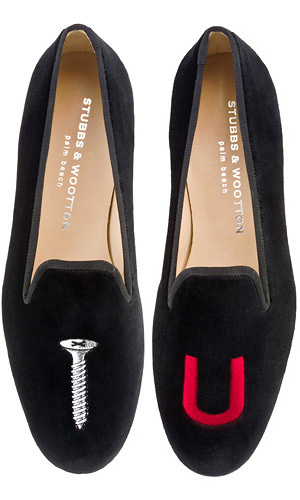 The screw u loafers are A-mazing! Screw U! Love it!!! Too funny….. Seriously too funny. Did you buy them? Those shoes are hilarious! Someone at the company has a sense of humor. Cute wedges!! They are my favorite alternative to traditional high heels. So much more comfortable! My dad has had a pair of Stubbs house slippers for YEARS…so they always remind me of him. Love the screw & magnet though…very fun! Yes, the slippers are mildly amusing, but YOU, you are hysterical! That is such an adorable pair. I love the wedges! I have been wanting a pair in yellow! I think they would be fun! I've found your blog through Blue Hydrangea and love it. Great post – loving the cheekiness of the embroidered slippers. And that bag is too cool. Thanks for sharing! haha! Insulting shoes. I would never wear them but they are pretty funny. I do love that bag. I don't have anything embrioded other than a few cardis. Maybe it's a new trend. That needlepoint bag is the mostest! I have to know, are the SC. U slippers women's or men's? Just hilarious. I can always count on you for a good laugh. My husband's 40th is next week. I was thinking they would be a good funny. Thank you for your kind comments on RHS. You are a dear blog friend! Super cute 🙂 Love that chair in the last pic! You are too funny, girlie! Coming here is always refreshing and such a delight. I always leave smiling! Now did you end up getting anything? those wedges are a dream — perfect for summer. Looking forward to buying a few pairs when we land in AZ. Is it possible my grandmother wore those years (like 30 years) ago?? I wish I could have given her the FU ones because she would have cracked up! The wedges are great. OH MY GOSH. that's me. Old school to the bone but like to shock the old schoolers a bit!!! that purse and those slip on's are great. 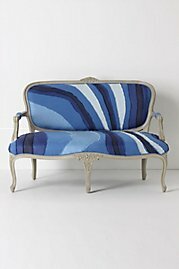 and i would kill to have that settee. I have spent the last 2 years trying to finish a needlepoint stocking, which I was WAY over-ambitious when I started. i do love the weekender, and your wedges are quite cute! they look super comfy, too. Ha, that needlepoint camo bag is hilarious! I love it!